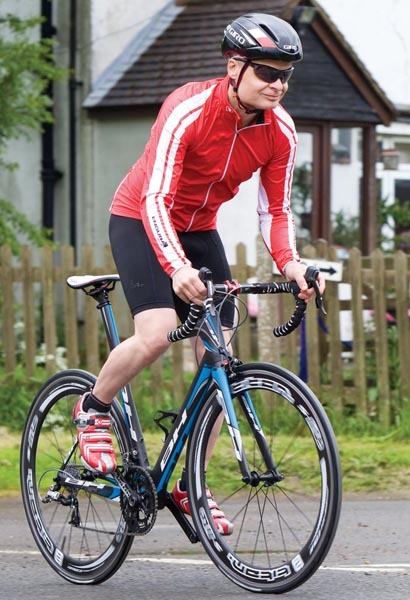 In the April issue of Cycling Active, we reviewed the BH Prisma. While we had some small reservations about the ultra-comfortable, somewhat sedate ride, we where impressed by the quality and specification of the build and were interested to look further at BH’s wide range of bikes. The brand was keen to show us something at the racier end of the performance scale — the G6 8.1. Built around BH’s pro-level G6 Global Concept one-piece carbon aero frame (used by the Sojasun pro team), the G6 8.1 sits towards the bottom of the range and caters for those with a fairly realistic budget. Nevertheless, it still carries a pretty high specification, incorporating SRAM Force shifters, front and rear mechs and cassette, a Rotor 3DF chainset (50/34) and a Prologo Nago Evo carbon-railed saddle. Finishing kit, including full carbon bars, is from BH’s own Titan brand, as are the brakes. Unlike many off-the-shelf race bikes, the G6 8.1 ships with a high-quality wheelset: Titan-branded Cole S-Lites, which are deep-section 50mm carbon hoops. Though racy, they offer some concession towards practicality, in that they take clincher tyres and feature an aluminium braking surface, so you can use regular brake pads and easily swap to a pair of everyday training wheels. All of this adds up to a high-performance, race-ready bike that weighs in at just 7.3kg. The frame is the real star of the show. Manufactured using BH’s Hollow Core Internal Moulding technology, the tubes taper and flatten from the huge oversized 86.5mm bottom bracket up to the tapered aero 1.5in head tube, which features its own internal moulded bearing races and is 20 per cent narrower than that of the previous G5 model, significantly reducing air resistance. 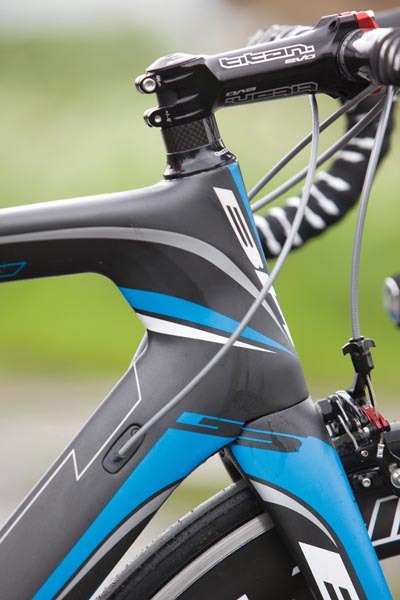 The frame uses a mixture of high and low-modulus carbon to achieve a ride that incorporates both stiffness and comfort. While the front triangle is designed for aerodynamics and super stiffness, the rear tapers through the chunky power-saving chainstays through to super-skinny seatstays for a better-quality ride. There is a semi-integrated seat tube, which, on a small model, needed to be cut down a little for me, a 5ft 8in rider (scary but true on this type of frame). 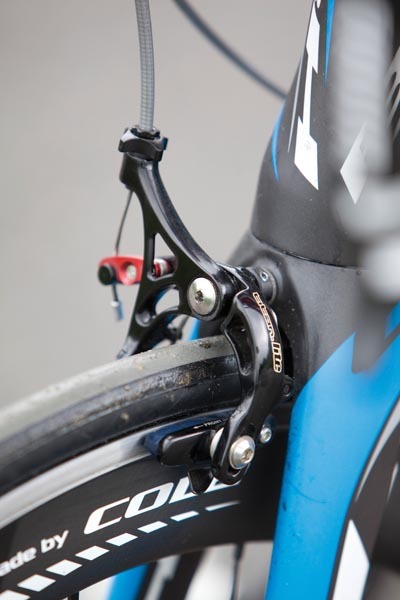 The cables are internally routed, with the interface designed to take both electronic and mechanical shifting systems. The G6 8.1 offers a lively ride. It accelerates extremely quickly and the high level of power-transfer from the laterally stiff frame enables you to maintain your speed. While it feels reactive, almost jittery on the road, it handles brilliantly. You can really rail the corners and, even when you feel it’s on the edge, you can manhandle it just that little bit more. The Titan brakes are excellent and the SRAM Force, with its double-tap system, gave crisp, reliable gear changes. I have long been a fan of Prologo saddles, and the Nago Evo did not disappoint. The half-round top strikes a great balance between firm race saddle and something suited to longer, more laid-back rides. There was some consternation about a race bike of this level having a compact chainset, but the Rotor 3DF is nevertheless a high-performance piece of kit. It features noQ asymmetric chainrings, designed to maximise the rider’s power by optimising the strongest part of the pedal stroke and aiding the weakest. Rotor concedes that not all riders will like the feel of the Q rings at first, but it claims the effect on performance is positive. I’m reserving judgement, but can confirm that it was relatively easy to sustain decent speeds for long periods of time, no doubt thanks to the holy trinity of lightness, stiffness and aerodynamics. Searching for small niggles, the cables rattle noisily at the front of the bike and the amount of branding on the wheels detracts slightly from the subtler styling of the frame. Otherwise, it’s difficult to find fault with the G6. What are the downsides to owning a bike like this? Very few, if a race-ready performance bike suits your riding. But we can’t ignore practicality and price. The G6 8.1 retails at £3,499, a lot of cash. Its wheels are perhaps a little too good for everyday use and won’t offer the best ride on a windy, winter ride. The G6 doesn’t offer the most relaxing ride you’ll find; it responds dramatically to your input and to the road. Which is exactly as intended; it’s not designed for the faint-hearted. Ultimately, though, this bike inspires confidence in its handling; it’s fast and fun, and that’s what a race bike is all about. The G6 8.1 represents another quality offering from BH. It’s attractive, available in a stealthy matt black with either red or blue details and is well-equipped. This bike sits in a range that goes from the Shimano Ultegra-equipped 8.0 model up to the 8.9, featuring electronic Di2 and Dura-Ace wheels — an indication of just how good the G6 frame is. If you have the budget and you’re looking for a bike to race — or simply to go very fast on — the G6 8.1 offers you a great chance to ride at least a little bit like the pros. The first model in the G6 range, the 8.0, retails for £500 less than the 8.1, without too many compromises. If you don’t get on with SRAM’s double tap or you’re just a Shimano loyalist, this one comes with equipped with the excellent Ultegra shifters and mechs. There is a nice FSA SLK chainset, if you prefer round rings, a San Marco saddle and Vision Trimax T42 deep-section wheels.